Friday night was DVD night again so brace yourself for another of those reviews that strives to tell you as little as possible about the movie. 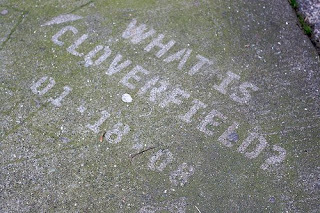 ‘Cloverfield’ is new to DVD here in Ireland and I was first-in to rent it out. This is one I wanted to see at the movies but that doesn’t happen much any more. The best I can hope to do is get in early on the DVD release (before Castlebar gets its grubby fingerprints all over it), get the Maltesers and the Sprite Zero in, and turn out all of the lights. I loved this movie. I recommend it to you and I look forward to seeing it again soon. But, before you rush out to rent/buy/steal it, let me tell you just a wee bit about it because, rest assured, you are not all going to like it as much as I did. ‘Cloverfield’ may have been pitched as ‘Godzilla’ meets ‘The Blair Witch Project’ because that’s pretty much what it is. A giant ‘something’ is attacking a city and we witness the attack through the medium of a single video recording recovered after the event. Yes, that’s it. Except somehow it’s more. What we get is an extremely convincing portrayal of what it must be like to be at Ground Zero of a major catastrophic incident. In this case it’s the far-fetched scenario of a monster from the deep or outer space or… someplace. It doesn’t matter what or where, the shock, terror, panic, disorientation and fear are all captured very authentically and very convincingly. And, before you get too annoyed with me, I don’t use the phrase ‘Ground Zero’ in any way lightly. This film will have resonance for any of us who hold the awful events of September 11th 2001 in our memories. The city under attack in this movie is New York and, even though it’s a freaky monster from God knows where, the imagery of the desecration of the city seems quite deliberately designed to pinch the nerve of our shared memories. The sight of a huge opaque dust cloud tumbling up the city block, citizens rushing to stay ahead of its deadly contents – this sight is not new to us. So ‘Cloverfield’ is monster movie entertainment from a new and highly-effective angle, no question, but it’s also pushing some pretty deep subliminal buttons along the way. So who won’t like it? Well, before you rent it, just know this – the hand-held camera work bucks and wobbles like no camera has ever bucked before. The effect in the cinema must have been seriously nauseating for some. You may not like the movie for this reason alone so be warned and don’t blame me if the Doritos come back up on the Axminster. The great trick that the movie pulls off is that it manages to look like an utter no-budget-credit-card-funded-guerrilla-flick whilst incorporating some of the most remarkable digital effects ever seen. They get away with this because the effects are never trumpeted, they just ‘happen’ and the filmmakers are always more concerned with the protagonist’s reactions than with how cool they have made their monster look. The film is a short sharp shock. It runs fast and it ends quickly. I like that, I hope you do too. I didn't like the movie. It was too hard to get into. I do like to watch people but I think it was the jittering screen that did it in for me. I liked the idea, and I did skip to the end to see what happened... but the ride there was quite bumpy and a trip I would not like to make again. Sadly this is a case of innovative storytelling gone awry...all because of the camera work. Understand, I WANTED to see this film, especially after seeing the previews. Guess I didn't expect 2 hours of "average guy on the run with poor video camera skills". It was easy to get caught up in the "good god what's going on?!" panic of the story. But all that jiggling gave me a headache. Then again, I managed to view that and "I Am Legend" the same week... maybe it was just too much "end of the world" without hope. Rodger and I saw this at the theater back in January. We mostly enjoyed it, but there was an older couple we noticed who left about 30 minutes into the movie. I don't think they liked the shaking camera much. Ken hits the nail on the head for mr. The director focusing on the protaganists and not the effects. Effects that are in the background, that just happen. Thanks for that review. I was just about to rent it, but after reading the DVD cover I didn't think my husband would like it. Now I know he wouldn't! Thanks, 'always appreciate the input. I can't wait to see it now. I don't know whether or not the shaky camera will bother me, but I will report back anyway. I am always "attracted" to movies or books presented in an unconventional manner. I think I will have to borrow this one. What I want to know is...is it Godzilla? It certainly sounded like Godzilla in the previews. No doubt my beloved will get this at some point and I will half-watch it whilst reading old newspapers and mending something and possibly checking email at the same time. The Doritos on the Axminster...now that sounds frightening! I can't really watch this movie (bad case of motion sickness will probably ensue) but I heard it was good. after reading your grand review I will have to rent it !! Everybody I have ever talked to says the movie stunk, which means I will buy or rent it, but when it makes its way to television, I might give it a go. I had mixed feelings about this having given up on The Blair Witch Project after something like ten minutes. I think the idea is better than its realisation. Could the monster not have started to tear up the city during daylight hours? As for a realistic portrayal it was pretty much spot on. I also liked that the events were taped over something else and every now and then we flick over to what was there before – a normal day. And it was a very quick watch so I was obviously entertained but I'm not sure how excited I am about it. Come to think of it, it's been a while since I've seen any film I wanted to rush out and tell all my friends about. Dear Miss Right: ('Never thought I'd write that one again after... oh, never mind) You are probably right (right geddit?) to avoid this if motion sickness is an issue - the Doritos will definitely re-appear. Kim: *Do* take the comments into account as well when considering renting - not everybody likes this and it *is* only 81 minutes long. Jim: Next time you see a film that hits the spot, you won't have to rush out to tell anyone, you can just get typing and tell us. I *do* know what you mean though, the truly remarkable cinematic experiences do seems fewer and further between. That could be down to us... but somehow I don't think so. BTW - I still think 'Blair Witch' is worth a full look - I think the ending is disturbingly well done. Might I suggest for this upcoming Friday, "Into the Wild"? I think you would really enjoy it. Thanks Ken for the review, it helped me to understand what that movie was actually about.